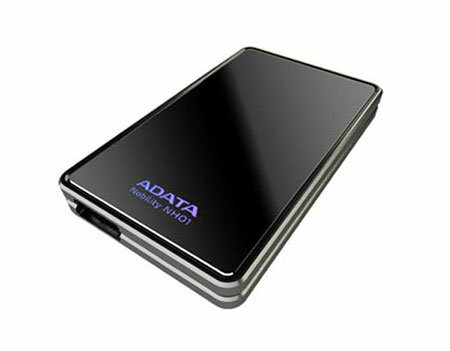 A-DATA has a brand new portable hard drive which is ready to ship to the masses, where it is known as the NH01. This is the first 2.5″ portable hard drive which is equipped with the latest USB 3.0 interface to arrive in markets worldwide after its debut at CES 2010 earlier this year. Taking full advantage of the new USB 3.0 interface, you can be sure that the A-DATA NH01 was specially designed to deliver astounding data transfer rates of up to 88 MB/s in read and 81 MB/s in write overall. Those figures mentioned have been proven to be three times speedier compared to a conventional hard drive equipped with USB 2.0 connectivity where real-world test results are concerned. After all, in this day and age, transfer speed has become critical where external storage devices are concerned since content these days are a whole lot larger in size, thanks to the amount of multimedia data floating around. When working in tandem with a next-generation interface, users of the NH01 will be able to enjoy the benefits of SuperSpeed USB 3.0 and increase their productivity by saving up to 70% on file transfer time when compared to USB 2.0 connectivity. Just how fast would the A-DATA NH01 be when it is running ahead at full steam? Well, all it takes to transfer a typical 24GB Blu-ray movie would be a mere 4.6 minutes, compared to 14.6 minutes required via a traditional USB 2.0 interface which is a pretty significant time saver by any standard. Apart from its superior transfer speed, USB 3.0 also offers improved connectivity between the device and its host computer to deliver enhanced energy efficiency compared to its predecessor. You will be able to choose from a variety of capacities that maxes out at 640GB, letting you carry or backup huge amounts of data on-the-go. Not only does it perform well, it will also come with a glossy front panel and coating located around the enclosure. Don’t worry if your computer does not have USB 3.0 support as it is backwards compatible with USB 2.0 ports as well.